Ivan Reitman's supernatural comedy has now achieved popular status but when it was released in 1984, its blend of special effects and humour wasn't universally well received by the critics. However, it went on to clean up at the box office and receive Oscar and Bafta nominations, and remains one of the few movies that is both genuinely funny and can bear repeat viewing. 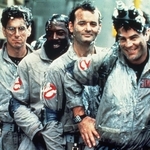 Bill Murray, Dan Aykroyd and Harold Ramis star as Dr Peter Venkman, Dr Raymond Stantz and Dr Egon Spengler, three parapsychology researchers thrown out by their university for lack of results who set up as freelance ghostbusters. At first, business is non-existent, but after clearing Sigourney Weaver's kitchen of a poltergeist, the work begins to flood in and their vault starts to fill with captured spirits. But real danger comes from the demon Gozer, who uses Weaver and her neighbour Rick Moranis as the way back into the mortal world from which he was banished, this time to finally conquer it once and for all. The three male leads (who are later joined in their work by Ernie Hudson) all enjoy great lines and Aykroyd even gives the best ones to Murray, whose reason for joining the team is just to meet women. Weaver is a revelation in her first comic part, playing her role deadpan as demanded, while even Moranis manages to rein in his propensity for over-acting. But the true stars were the special effects, the best-ever seen in a spoof film at the time, created by a team led by multi Oscar-winner Richard Edlund, and ranging from Slimer (who changed sides for the cartoon spin-off) to the gigantic Stay-Puft Marshmallow Man.